This unique garlic sauce from Taste of Essence can be used not only as a sauce but as a marinade, sandwich spread, salad dressing base, vegetable dip…I could really go on and on about all the ways to cook with it. Recently, I mixed 1 tbsp with a 1/2 cup fat free plain Greek yogurt and dipped some raw veggies and toasted pita chips into it…YUM. Seriously, you can use this magic sauce on just about everything. While Garlic Essence isn’t super low in Points, it is still much less than traditional aioli. But since it is so incredibly flavorful, you really don’t need much. Each 1 tbsp serving is 3 Weight Watchers Points. And it’s vegan gluten-free, Non-GMO, and absolutely delicious. It is available at a few grocery store chains. 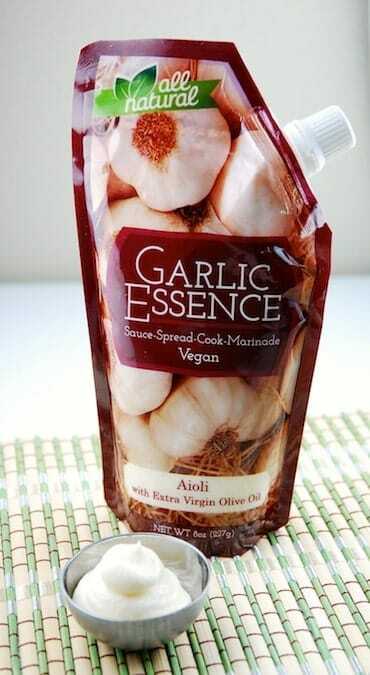 If you are looking for a good, Vegan product to help “wake up” your meat, veggies, fish, dips, etc, then Garlic Essence is a must try.